This was a four hour tour around the island that encompasses both Dutch St. Marteen and French St. Martin. As such, it provided a broad overview of the island including both its urban centers and some of its best known attractions. Of course, since it was a brief tour, there was not time to swim at the island's famous beaches or to do much shopping. For that, you would need a more focused tour. Because this was an introductory tour, it would primarily be of interest to first time visitors to the island who want to see its major sights. At the same time, it may be of interest to people who have visited the island before and who want to see how the various sights that they have visited previously fit together. As the name suggests, the tour vehicle is a two level bus. The top level is open. However, a cloth awning can be pulled out to cover the upper seating area in the event of rain. The sun can be quite strong in the Caribbean and so it is wise to take along a hat and lots of sun block if you are going to sit on the upper level. Also, beware that at times the bus passes close to palm trees and other foliage that extends out over the road. In such cases, a branch may protrude into the passenger compartment requiring passengers to duck so as to avoid being hit in the face. There was a headset at each seat on the upper level. We were told that we would need these to hear the guide's commentary, which would otherwise be inaudible because of the wind. However, there were also spekers embedded in the walls of the bus by each row of seats and the commentary was clearly audible throughout the tour via the speakers. As a result, very few of the passengers wore their headphones. The commentary was by a uniformed guide who divided her time between the upper level and the lower level. Her narration included bits of history about the island, some facts about life there today and a few jokes. Of course, she pointed out the various attractions as they passed .by. After leaving the cruise terminal, the bus drove up the eastern side of the island to the French part of the island. This area was more sparsley settled and much less affluent than the residential areas that we would see on the western side of the island around Simpson's Bay Lagoon. It also became increasingly hilly, which posed a challenge for the bus. The first stop was Orient Beach, St. Martin's most prestigous beach. It is a long, gently curving strand of white sand. Quite pretty but it has been extensively developed with bars and resorts all along its landward border. We stopped at the KonTiki Bar. The guide said that we could buy drinks at the bar but there was no hard sell. Everyone seemed content to have passengers access the beach via the bar and spend the brief period that we were there walking along the sand. Next, the bus turned west heading for the French capital Marigot. Before we arrived there, we passed communities of luxury homes overlooking Orient Bay. We were caught in traffic going through Grand Case, a community known for its restaurants. Paradise Peak, St. Martin's highest elevation appeared on the left. We also saw a group of orange colored iguanas who were relaxing in trees along the road. Coming out of the mountains, Marigot appeared before us. A pretty town with perhaps more character than commecially-developed Philipsburg on the Dutch side, Marigot was quite busy. Although only four cruise ships were in port that day in St. Marteen, several tour buses were parked in the lot near the ferry terminal. The open air market was also in full swing. The passengers dispersed to spend this brief stop shopping, taking refreshment in the cafes or finding relief at the public restrooms. When the passengers had reassembled, the bus continued west along Simpson's Bay Lagoon. The masts of yachts began to appear. Luxury homes, condominiums, and time shares began to consume the landscape. By the time we were nearing Princess Juliana International Airport, shopping malls, bars and high rises had become dominant. The destination here was Maho Beach, world famous because airplanes landing at the airport swoop down low over the beach. It was never intended to be a tourist destination and so the infastructure around the beach is often stretched to the limit with traffic congestion. Pulling over to the side of the road some distance from the beach, the bus discharged its passengers with strict instructions to return to this spot in 15 minutes. It could not park there and so it would be circling until we returned. Maho is a small beach and it seemed like most of it was covered with people. Only a few children were playing in the water. Everyone else was staring out to sea hoping to spot an airplane coming in for a landing. The tour literature states that there is no guarantee that passengers will see an airplane. However, during our quick time at Maho we saw four - - an airliner coming in as we were walking to the beach, two private planes and a 747 jumbo jet just as we were leaving. Not intellectual entertainment, but good fun nonetheless. 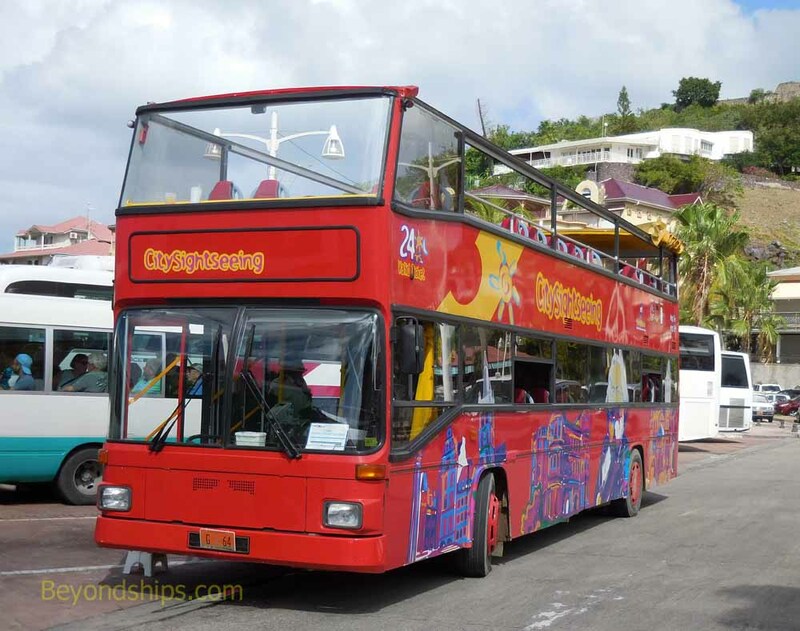 After leaving Maho, the bus climbed the hills that separate the western side of the island from Phillipsburg. At the top of the first hill, the bus paused for a photo stop looking back towards the airport and the Simpson's Bay area. Around this time, storm clouds gathered and a heavy rain began to fall. The guide went to the back of the bus and pulled the cloth canopy forward. This shielded most of the passengers from the rain but some seated by the windows were subject to rain driven by the wind. However, this tropical cloud burst did not last long. The rain had almost stopped as we rfeached Philipsburg. Here, passengers were given the option of being dropped off in St. Marteen's main shopping area and making their own way back to the ship. Perhaps a third of the passengers choose this option with the rest electing to take the bus back to the cruise port. This tour was handled professionally. Both the guide and driver were friendly and helpful. Complimentary bottles of water were available from the staff. This was very welcome as the sun was quite strong during most of the tour.